Based on data from a major survey, Teacher Collaboration for Professional Learning features extensive case examples from model research communities collaborating within schools, across districts, in partnership with universities, and as online networks. The book also offers a wealth of reproducible templates as well as reflection questions and exercises?invaluable tools for organizing study groups. Cynthia A. Lassonde, Ph.D., a former elementary teacher, is associate professor of Elementary Education and Reading at the State University of New York (SUNY) College at Oneonta. Susan E. Israel, Ph.D., is an independent researcher, writer, and literacy consultant. 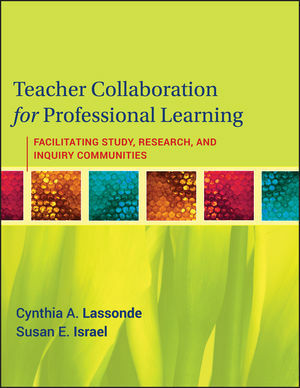 Lassonde and Israel have written many books and articles on teacher research, teaching and learning, and literacy. Foreword by Janice F. Almasi. PART 1 Why Support Collaborative Research? Chapter 1 Improving Teacher Professional Learning. Chapter 2 Initiating Educational Improvements. PART 2 Building a Professional Learning Community. Chapter 3 Understanding the Inquiry Process. Chapter 6 Ethical Considerations: Improving Group Dynamics. Chapter 7 Leadership Strategies for Collaborative Support Groups. PART 4 Model Learning Communities in Action. Chapter 8 School-Based and Partnership Communities. Chapter 9 Networking and Online Collaborations. Chapter 10 A Districtwide Model: The Fairfax County Public Schools Teacher Researcher Network, Contributed by Gail V. Ritchie. Epilogue: Supporting and Sustaining Professional Collaboration. Appendix A Tools and Templates. Stage 1: Getting to Know Invited Members. Brainstorming Chart: Whom to Invite to the Group. Stage 2: Sharing Perspectives and Talents. Stage 3: Supporting Each Other’s Efforts and Learning. Stage 4: Exploring the Possibilities. Appendix C Study Group Exercises. Appendix E Teacher Research Survey.